Just for the hell of it, I tried the exercise bike in the station gym. I was hoping to get a sense of heart rate thresholds. I did a warm-up for 20 minutes, then pushed it for 5, then eased back for 2, and then went again, repeating that 5 minute burst 4 times in all. The machine gives you readings for current speed, elapsed time, distance covered, Kilojoules expended, and heart-rate. Couldn’t say how accurate it is, but like my bathroom scales (which also came from one of those four-letter German multiples), it’s not that critical as long as you keep using the same point of reference. Anyway, it was a workout with a difference. I don’t know if I learned much from it. At a reasonable pace of over 30km/h, the heart rate was steady around 125; pushing it up mid-to high thirties on the efforts, it rose to a max of about 150bpm. It’s not an estimate of FTP (functional threshold pace), but then it’s probably moot anyway; I don’t have a heart rate monitor or any accurate way testing wattage, bar the bike computer, when I’m out on the road. Which again, I only really use for speed readings. I drank a lot too. And it was warm up there in the upstairs gym. That’s not a leaky bottle. That’s a leaky body. And that’s just what dripped from the handlebars. 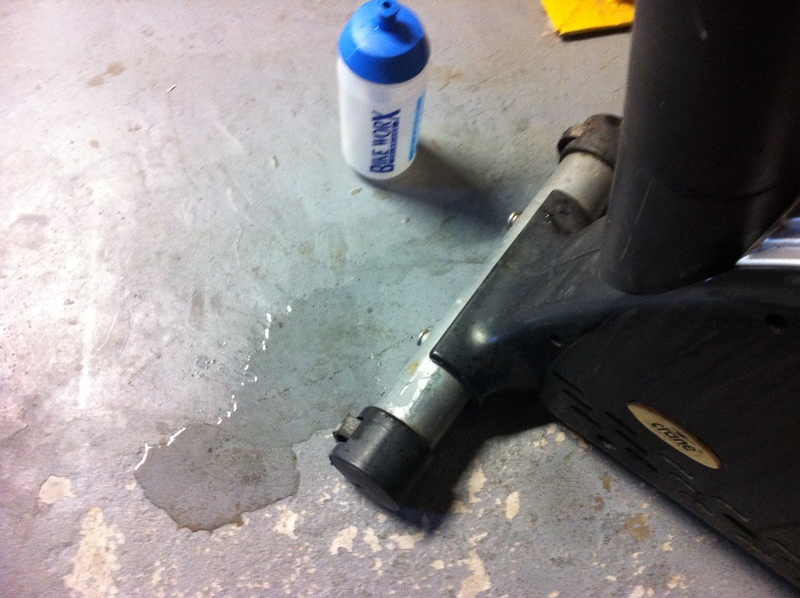 I guess you lose that much on a real bike – you just rarely get to see it accumulated on the floor below!